The C. Gotzian and Company Building occupies a large corner site at the edge of Mears Park. It was designed to house the company factory and showrooms. The second- and fourth-floor windows are inscribed within large arches set one above the other. The second-floor windows are set in pairs within larger arches. Stone detail contrasts with colorful brick. The narrower Paul Gotzian Building was built in 1895 at 352 Wacouta Street and is similar in design but with more variation in the window detail. 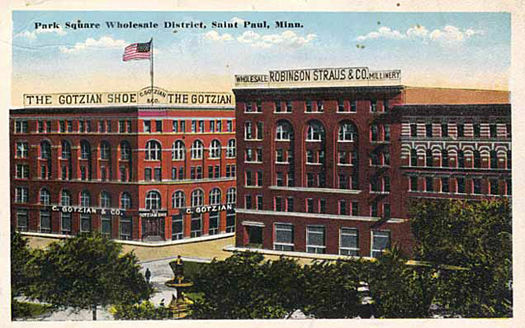 Gilbert's exploration of color and texture in masonry materials begins with the Gotzian Building. In 1899, he would combine brick and colored terra cotta in the Broadway Chambers Building. Several succeeding buildings reflect the evolution of Gilbert's use of decorative surface texture and color. 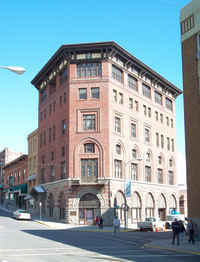 The finest examples are located in the West: the Montana Club (1903-05); the State Savings Bank (1906-08); the Placer Hotel (1912). Gilbert's use of color and texture reached its zenith in his designs for the University of Texas (1909-16).